A police investigation has been launched after a video posted online appears to show an officer macing a group of bikers on a highway in Texas. The video was posted Monday, a day after the incident took place on the US Highway 297 in Fort Worth. The episode began when a police officer pulled over a red pickup truck which was traveling with the bikers and issued citations to the driver for not having a license, and to two others for standing in the bed of the truck. As the bikers approach, the video shows the officer get out of his vehicle and spray them with what seems to be pepper spray. 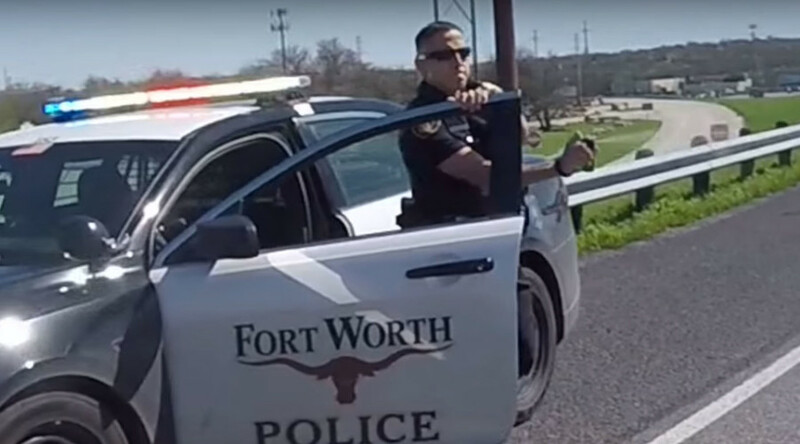 In a statement, Fort Worth officials named the policeman involved as Officer Figueroa, a “six-year veteran” who has been “removed from uniformed patrol duties and placed in an administrative capacity pending the investigation”. Police say they had received a number of calls reporting reckless driving relating to the motorcyclists. However, the biker who shot the video disputes this claim. Biker Jack Kinney said he did not see any reckless driving and accused the department of running a “propaganda campaign to try to mitigate the damage”, The Star Telegram reports. Another biker called Chase Stone said the police action could have resulted in serious injury or death.